Perfect for labeling file folders and binders, name badges, and small signage. Laminated surface wipes clean. Withstands water, grease, grime, fading and abrasion. 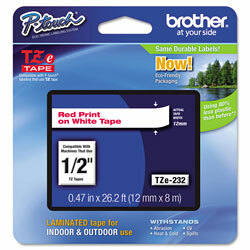 Label Size - text: 1/2" x 26 1/5 ft.; Label Color(s): White; Machine Compatibility: Brother P-Touch® PT-1000, PT-1000BM, PT-1010, PT-1010B, PT-1010NB, PT-1010R, PT-1010S, PT-1090, PT-1090BK, PT-1100, PT1100SB, PT-1100SBVP, PT-1100ST, PT-1120, PT-1130, PT-1160, PT-1170, PT-1180, PT-1190, PT-11Q, PT-1200, PT-1230PC, PT-1280, PT-1280SR, PT-1280VP, PT-128AF, PT-1290, PT-1290BT, PT-1290BT2, PT-1290RS, PT-1300, PT-1400, PT-1500, PT-1500PC, PT-1600, PT-1700, PT-1750, PT-1800, PT-1810, PT-1830, PT-1830C, PT-1830SC, PT-1830VP, PT-1880, PT-1880C, PT-1880SC, PT-1880W, PT-1890C, PT-1890SC, PT-1890W, PT-18R, PT-18RKT, PT-1900, PT-1910, PT-1950, PT-1960, PT-200, PT-2030, PT-2030AD, PT-2030VP, PT-2100, PT-2110, PT-2200, PT-2210, PT-2300, PT-2310, PT-2400, PT-2410, PT-2430PC, PT-2500PC, PT-2600, PT-2610, PT-2700, PT-2710, PT-2730, PT-2730VP, PT-300, PT-300B, PT-310, PT-310B, PT-320, PT-330, PT-340, PT-350, PT-3600, PT-4000, PT-520, PT-530, PT-540, PT-550, PT-580C, PT-6100, PT-7100, PT-7500, PT-9200DX, PT-9200PC, PT-9400, PT-9500PC, PT-9600, PT-9700PC, PT-9800PCN, PT-D200, PT-D200BT, PT-D200DA, PT-D200MA, PT-D200SA, PT-D210, PT-D400, PT-D400AD, PT-D400VP, PT-D450, PT-D600, PT-D600VP, PT-E100, PT-E300, PT-E500, PT-E550W, PT-H100, PT-H300, PT-H300LI, PT-H500LI, PT-P700, PT-P750W, PT-P750WVP, PT-P900W, PT-P950NW, ST-1150, ST-1150DX, ST-5; Printed Text Color(s): Red. White Label Maker Tapes and Ribbons from Brother! 1138 In Stock today.